Years ago, I had a period in my life where I experienced dreams that were more than just simple dreams. This painting is about one of those dreams. In it, I am a whale in the Pacific Northwest. I’m not an Orca, I’m larger than that. Perhaps a grey or humpback. I know I am being hunted by a local tribe. We are not enemies. We are NOT enemies. Rather than fight them, I roll over and allow them to pierce my abdomen at my umbilicus with a very large wooden spear, giving my flesh to them. As the spear pierces my whale belly I look down to see that I am no longer the whale but my current physical self with a wooden spear piercing my body front and back at my belly button. Everything turns to white and I wake up. 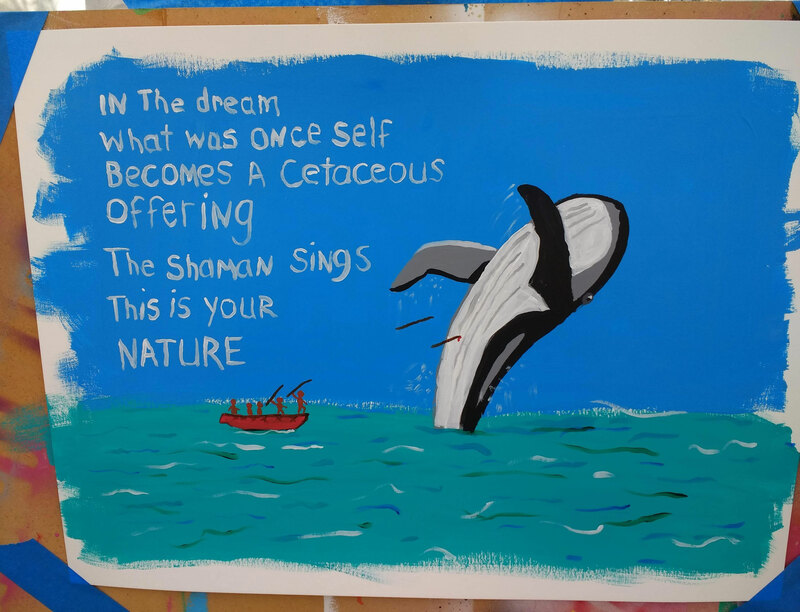 A friend took my dream to our local Paiute shaman who said that this was a message about my true nature.